In their continuing quest of personalized designs, Dell has now partnered with Opi nail polish! You can now choose between 26 shades from "I'm Not Really a Waitress" to "Dear Santa" to "Teal the Cows Come Home" to color your new laptop! I really like the red glittery one that is Dear Santa (shown in the picture). Visit Dell Design Studio for more info. It is a shame that I do not need a new computer! 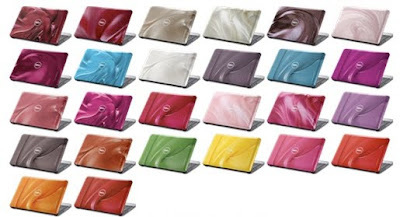 These laptops look stylish yet c'est chic ! These computers are just delectable. Fortunately I do need a new laptop, or is it a notebook?